Anyone an idea where file should be located? I did a quick search and couldn't find it. Sorry man, no idea. But Since you started this thread I'd like to add another error.
" 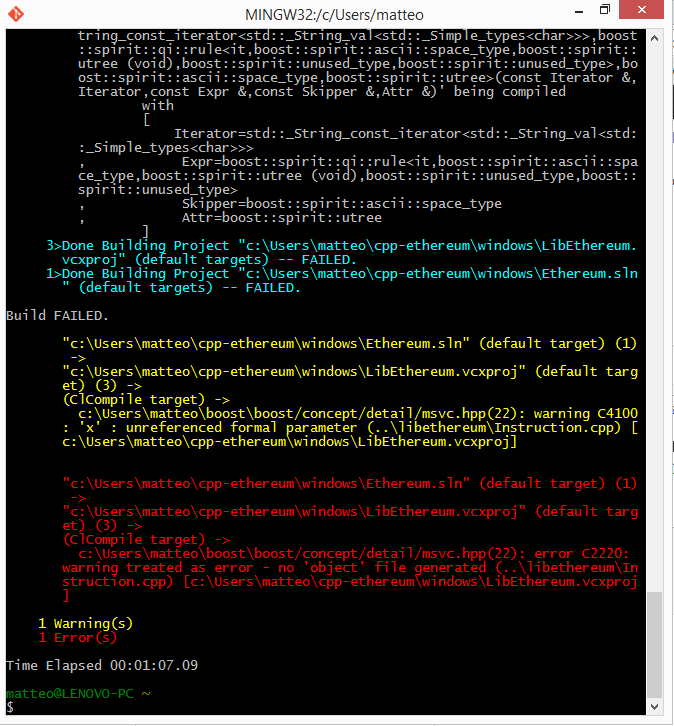 curl -O https://raw.github.com/ethereum/cpp-ethereum/develop/windows/bootstrap.sh "
" curl -O https://raw.githubusercontent.com/ethereum/cpp-ethereum/develop/windows/bootstrap.sh "
I've disabled the C4100 warning (and fixed another) so develop branch is compiling for me as of revision 246eba286934e6. Check there. Might be that Qt didn't compile properly for some reason. If you delete the x64 or Win32 folder and run bootstrap.sh it should compile it again. Building Qt is a barrel of fun, but sadly they don't ship binaries for VS2013 last I checked and VS2013 is the minimum MSVC compiler that'll compile C++11 heavy Ethereum code!